12-01-15 – May I pretend that instead of you reading this, I’m speaking to you for the first time, just moments after parking just down the street from your house? You e-mailed me, after all, for a landscape consultation. You told me quite a number of details about the house you’ve lived in for years, or just recently bought – what direction it faced, the color, the brick accents, what year it was built. You should try your hand at poetry – you’re good. Because in your e-mail, you summed up the entire property in just three simple words: “Tired, old landscaping.” Well, I’m here, and it’s your nickel. Let’s take a look. I didn’t park on the street in front of your house, or in the driveway, because the first thing I want to do is take in the scene from the street, and my red pickup just gets in the way. Homeowners never look at their houses as if they were potential homebuyers, or neighbors, or unknown travelers in a car passing slowly by. I look at a property as all three. What do you want first, the good news, or the bad news? I call them pocket gardens, little circles of plants that dot and plop here and there, defeating any shot at an attractive landscape. My overall first impression? The front yard landscape is a random collection of trees and shrubs that were planted without any sense of cohesiveness, utility, or flow. I can see survivors from the original, 1980s landscaping, plus adjunct contributions made by the various owners since then, a few shrubs here, the fledgling pine over there, a circle cut in the lawn for flowers by the driveway. Ringing the circle with concrete block, or bricks, small boulders or flagstone simply banishes it more completely from the property. Those tall, dark green, jutting shrubs running in a straight line along the front of the house are the original yews; your house faces north, so that front bed was probably shady the day the house was completed. Unless I get down on my hands and knees and burrow in, I can never tell how many. Could be three, could be six. Those windows they hide – any interest in seeing out of them from inside the house? Good, because the yews need to go. 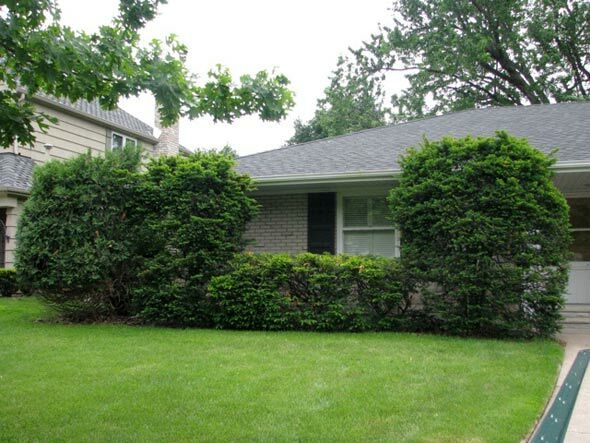 I’m sorry, the house faces south, those are spirea (or substitute your desperate shrub type here), planted originally in full sun, in a cute little curve to mimic the living room window bump-out. Old, woody, never much summer bloom anymore, seeing as how the mature tree canopy now places them in partial shade. Not much to look at in summer, and even more discouraging in winter. You are correct – they go. Let’s continue around the side, the long stretch of garage exterior wall, the wall that was most prominent to my view as I drove up your street. I’ll be danged, they’re spreading cotoneasters, dear old Cotoneaster divaricatus. Well, you’re doing something right, expert gardeners across North America who love cotoneasters – all six of them – rarely are able to grow them to a height of eight feet. Too bad their width is roughly comparable. You’ve tried to hack them back, I see – a machete is my guess – but they just laugh in your face, correct? How old are they? Well, not exactly sure, but they were ugly at least twenty years ago. 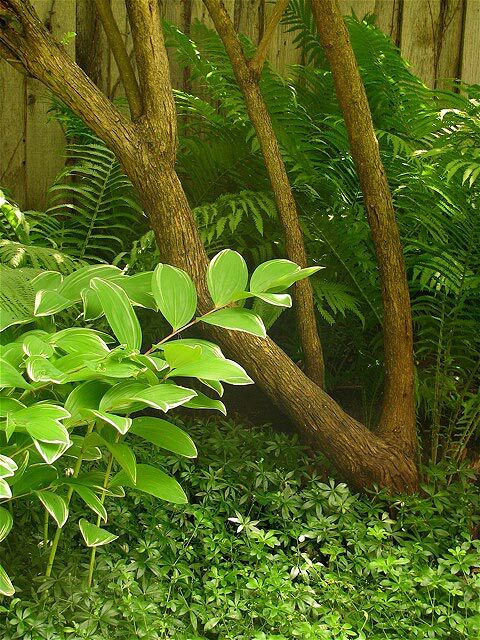 Wider foundation beds allow you to layer small trees and shrubs. The big problem I see is that the foundation beds around the house are way too narrow everywhere I look; that was the style decades ago. 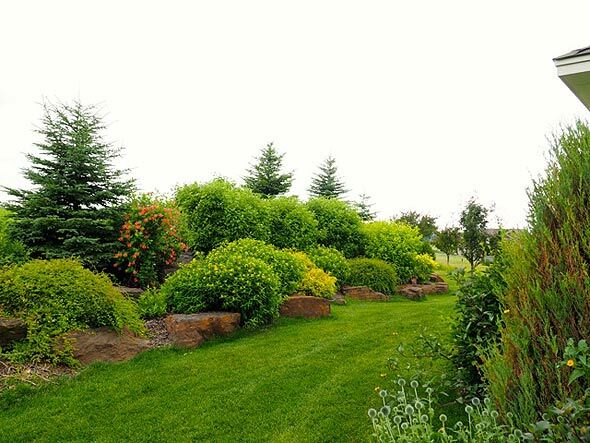 They’re in a straight line parallel to the house foundation – well, that one curves a bit – but are wide only enough for a single row of shrubs. 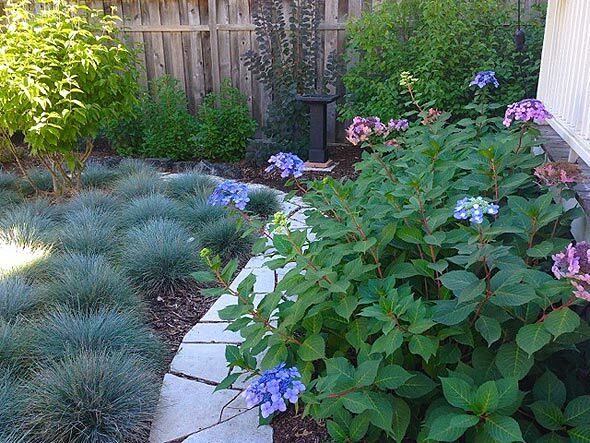 You need to bump the beds out much wider, create spaces where you can plant evergreen and deciduous shrubs in layers, with room for perennials in front, if you like. That old, gangly spruce that’s been pruned a full third of the way up, barely clinging to life near the fence in the side yard, you like it? Me neither. Have it removed. 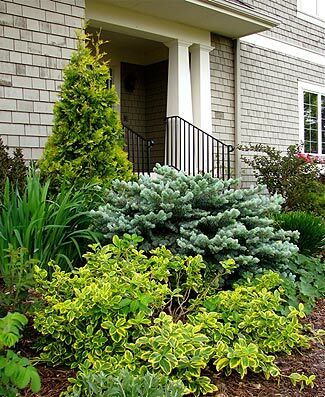 Then you can plant a fresh evergreen tree a proper distance from the fence, and give it some company by planting the fence line with layered shrubs, to create a nice, curving bed featuring the new evergreen. Oh, and leave the base branches alone. You’ll get used to it. A straight perimeter fence need not dictate the design, nor dominate the scene. What about the mammoth clumps of old, gray (insert your tall shrub here – I’ll use lilacs) just beginning to bloom, but only at the tips, that crowd both corners of the yard out near the street? Can I do a renewal pruning, you ask? Sorry, life is too short. I’ll give you some ideas for their replacement, what I call front corner medallion plantings, but it’s going to include at least three different plant types, possibly mixed deciduous and evergreen, with three different foliage colors, probably a blue, a maroon, and a yellow. Some of the lawn is in fairly good shape, where it gets some sun, but when you look at the various lawn areas as a whole, any particular shape come to mind? Rectangular, you say? Me too. A lawn should always be the lake, or the pond, or river. 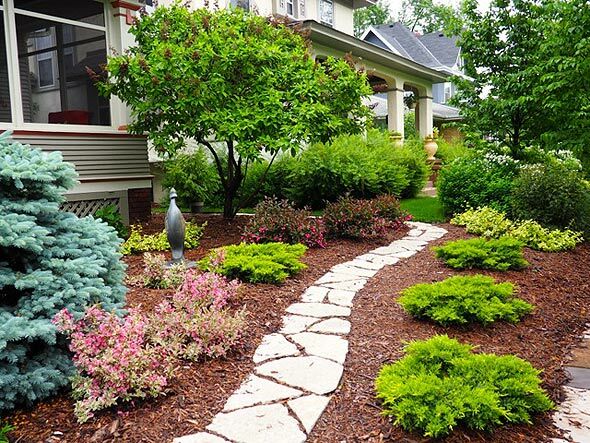 Landscaping – the small trees, the shrubs, the perennials – create the shoreline. You ever see a rectangular or square lake? 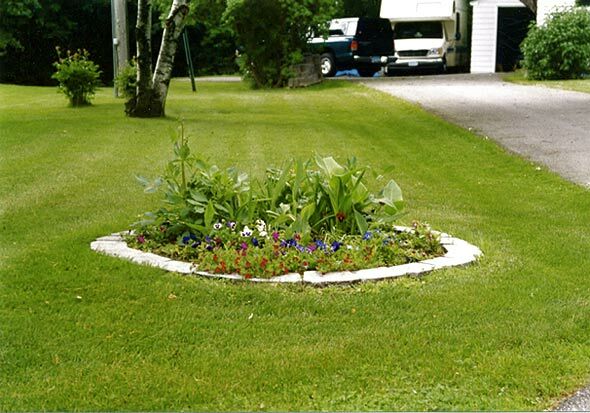 Lawns should curve and flow. 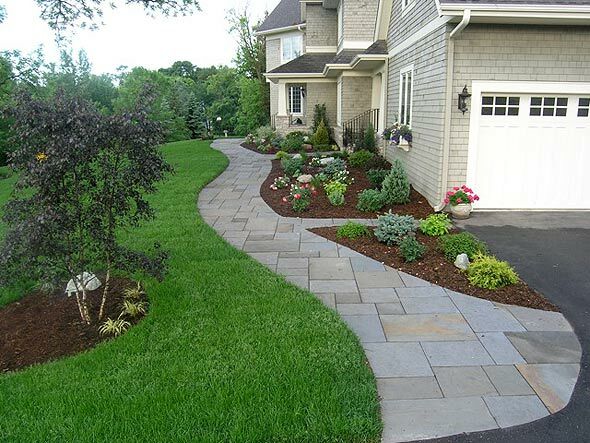 Landscape beds should curve and flow. Together, they create a single, unified landscape. Hey, the back yard has some potential. The oak in the left rear corner is gorgeous, it’s eighty years old if a day. And the red maple in the right corner is beautiful. It’s quite a bit younger, whoever planted it got it in the right spot. It’s getting upward to thirty feet tall, and looms well above the roofline. With the oak in the other corner, the trees give a very nice, rounded backdrop to the house when you look at it from the street. Large trees in the back yard are the matte of the painting. 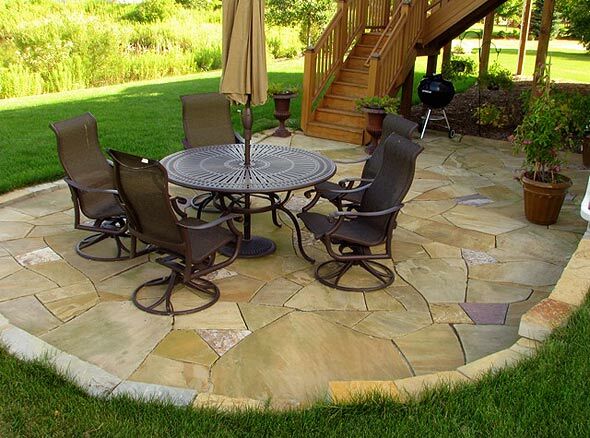 Plus they’ll provide a nice shady spot for the stone patio you lack. And the water feature, since your yard lacks a water element. It’s your luck day, I’m currently running a special on boulder fountains. We’ll talk. Though they’re not called shade trees for nothing, eh? You bet it’s hard to grow lawn back here. That’s OK. There are only a couple hundred perennials, as well as some great shrubs and small trees, all of which thrive in the varying degrees of shade I witness here. 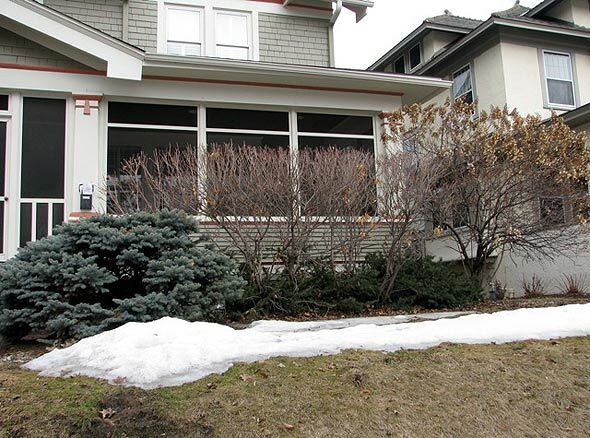 Amend the soil with compost – trust me, it will need it – and you can create a soothing, shade landscape that won’t take any more time than fertilizing, watering, mowing, and raking the same amount of lawn. Wow, our time together has really flown by! I hope this was helpful. Remember, an old landscape is similar to an old kitchen. When it comes time to remodel, you’ll find there will be very little, if any, of the old kitchen that remains. So thanks, I going to take off…what’s that? You wish you had more specifics? Well OK, I’ll head home, you head back inside, sit down at your computer, go to my site, and click here for Landscaping 101. No, no charge for my time today. This was fun.